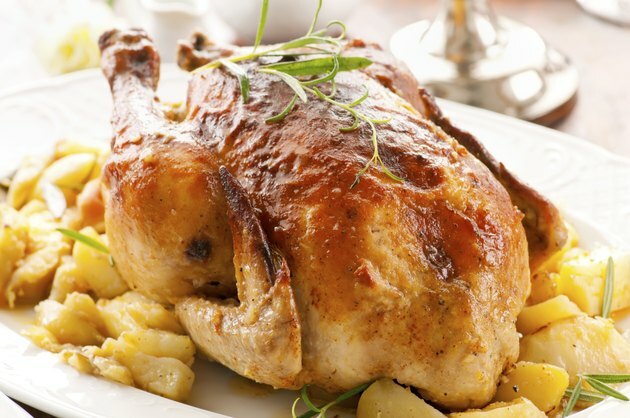 A warm, roasted chicken makes a satisfying and hearty meal. If your oven is out of commission, you can make roast chicken on your stovetop. Use minimal fats to prepare the bird and you'll cut back on the amount of fat and calories in this high-protein dish. Roasting a chicken on the stovetop is a quicker and easier process if you cook cut up chicken pieces instead of using a whole chicken. You can further cut back on the fat in the dish by cooking white-meat parts of the chicken, such as the breasts, only. Keep your chicken moist without adding a ton of fat to the dish by brining the chicken parts for at least four hours before roasting. Combine 1/2 cup of salt and 1/2 cup of sugar in 2 quarts of water in a large bowl and soak all of the chicken parts in the bowl, refrigerated, for up to 12 hours. Skip this step if you are concerned about your sodium intake. Pat the chicken parts dry with several paper towels as well as you can, trying to remove as much moisture from the skin as possible. Drizzle a small amount of a healthy oil, such as olive oil, into a large non-stick skillet. Heat the skillet on the stovetop over medium-high heat until the oil shimmers in the pan. Place the chicken pieces in the hot skillet with the skin sides of the meat facing down. Cook the chicken without moving the pieces for five to 10 minutes, until the skin is golden brown. Flip the chicken pieces over with tongs and pour 3/4 cup of water or chicken stock into the pan. Set the lid on the pan and continue to cook the chicken for another 10 to 15 minutes. Crisp the chicken skin by removing the chicken from the pan. Pour the liquid out of the skillet, saving it to make gravy, if you wish, then wipe the pan with a paper towel. Add 1 teaspoon of oil to the pan and place the chicken pieces back in, skin sides down, and cook them until the skin gets crisp, about five minutes. Use an internal meat thermometer to test the chicken for doneness. Cook the chicken until the meat inside any chicken breasts reaches 160 degrees Fahrenheit. Check that legs or thighs reach 175 degrees Fahrenheit. Remove the skin from the chicken prior to eating to cut back on your fat and calorie intake. Which Are the Fatty Parts of a Chicken?